Wax Capacity: About 3 Kg. Setting Time range for vacuum -0-24.9 Sec. 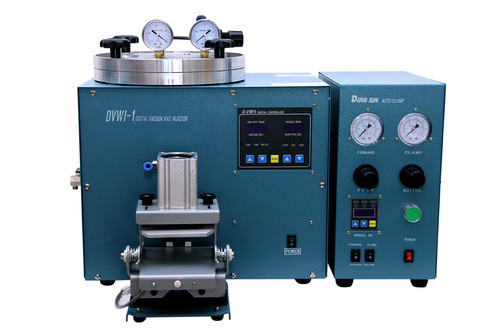 Setting Time range for wax injection – 0-24.9 Sec. Gurukrupa Enterprise is the dominant Manufacturer and Supplier firm developing state of the art Jewellery Casting Plant since its inception in 1994. Accomplishing our strategic priorities to build enduring client relationships, we are engaged in managing the expanded product assortment, which includes next generation Gold Melting Machine, Vaccume and Casting Machine, and Wax Burnout Furnace. Our developed machinery has strong potentials for our growth as it is widely acclaimed for its compact design, remarkable functionality, high temperature control, low power consumption, user friendly operation, and reliable performance for a long time. Our USP is our strong presence in the key market and strengthened relationships with a huge clientele. Moreover, our pioneering stature is underpinned by the performance driven business strategies that equips us to create innovative machinery that continuously streamline all aspects of our clients’ business. Besides, technology plays vital role in our sustained growth, as we have implemented modern day die press and vacuum machines at our infrastructure. Our highly experienced team focuses on strategic acquisition and product innovation to harmonize our operations with R&D activities. This helps us to fortify our endeavors to develop high performing and cost effective machinery.